The only problem is that they haven’t been made available. 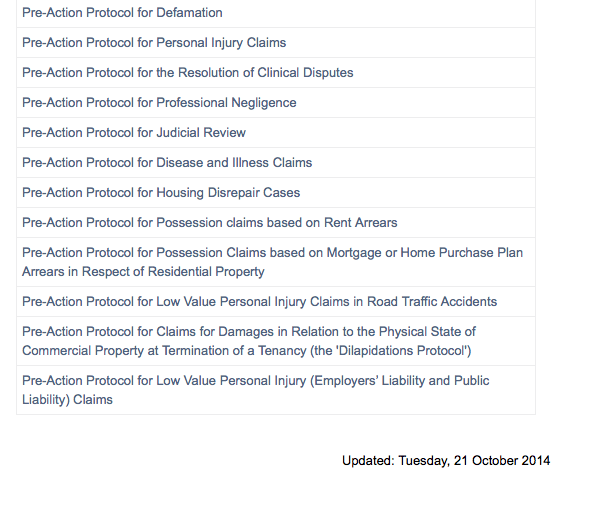 The Justice.gov.uk protocols page was last updated on 21 October 2014. So, while hoping that they magically appear first thing on the morning of 7 April 2015, we are currently required to rely on and comply with completely mysterious pre-action protocols. Posted in Disrepair, Housing law - All, Mortgage possession, Possession and tagged judicial-review, pre-action protocol. Bit I’m afraid the answer is not in a good place. The legal aid cuts for benefit cases below the Upper Tribunal are evil. It might be an appeal to the First Tier Tribunal on the bedroom tax decision, on the basis it is discriminatory, but there are complex issues there, depending on circumstances. Thanks for including a link to our post – just to let you know we’ve updated it with more information. I have just read the PAP for social housing possession (following Anna’s link). I was a bit confused at first, but I think I’ve worked out what’s going on now. Although I’m not completely sure. 1.2. Part 3 of the protocol does not apply to cases brought by social landlords solely on grounds where if the case is proved, there is a restriction on the Court’s discretion on making an order for possession and/or to which s89 Housing Act 1980 applies. 3.1 This part applies in cases where if a social landlord proves its case, there is a restriction on the Court’s discretion on making an order for possession and/or to which s. 89 Housing Act 1980 applies (e.g. non-secure tenancies, unlawful occupiers, succession claims, and severing of joint tenancies). At first I thought 1.2 was saying that Part 3 only applied if the claim was being brought solely on mandatory grounds. But now I am thinking it must be solely on grounds that are mandatory. So although you sometimes hear people talking about s21 being a mandatory ground, it’s not really a “ground” at all – possession on grounds (for assured tenancies) is dealt with by s8 and Sch 2. So Part 3 doesn’t apply to possession solely on grounds 1 – 8, etc. but it does apply to possession based on NTQ, s21, or mixed mandatory and discretionary grounds. The problem with this analysis is that Part 3 is headed “MANDATORY GROUNDS FOR POSSESSION” – which seems to suggest that “grounds” is intended to include reasons such as “unlawful occupiers” which would be dealt with solely by NTQ. Either way, it’s slightly surprising that a landlord using grounds 8, 10 and 11 will have to consider Part 3, whereas a landlord using ground 8 on its own won’t – although they would both be subject to Part 2. And why is it that the examples given in 3.1 don’t include s21? From my experience I would have said that was the most common mandatory reason for possession with housing associations (they don’t tend to use ground 8 around here). And similarly I’ve seen far more claims for possession of introductory tenancies than I have for “severing of joint tenancies”. 1.4. Part 3 seeks to ensure that in cases where Article 8 of the European Convention on Human Rights is raised the necessary information is before the Court at the first hearing so that issues of proportionality may be dealt with summarily, if appropriate, or that appropriate directions for trial may be given. I’m not sure how important a statement like this is – addressing the purpose of part of the PAP. But I hope Part 3 also seeks to ensure that public law defences can be dealt with summarily, if appropriate. And perhaps it even seeks to make sure that disability discrimination defences are teased out at an early stage too? I am still a bit confused (don’t panic, this is perfectly normal). It will be interesting to see how social landlords interpret the new PAP. And it will be interesting to see whether the courts agree with them. Timmy, some of us here thought there could be a typo in para 1.2??? or are we too naïve??? We are discussing if, in that para, ‘Part 3’ should read ‘ Part 2’ (in effect Part 2 replicates the former protocol for rent arrears claims); or if the ‘not’ should not really be there… What do you think? I don’t think it can be right that 1.2 was meant to say Part 2 because that would mean landlords didn’t have to follow the old rent arrears PAP if they just used ground 8. So even though the landlord was seeking mandatory possession because of rent arrears, the court wouldn’t be interested in them doing all those things like helping with Housing Benefit, holding off if an agreement was in place, providing rent statements, etc. If you take away the “not” from 1.2 then it reads very awkwardly: “Part 3… does apply to cases… etc.” – surely they would just say “Part 3… applies to cases… etc.” (like it does in 3.1). And if they meant to say it did apply then wouldn’t 3.1 be redundant? But if it’s not a typo then the question remains: what is it actually trying to say, and why? What is the fundamental difference between a claim against a trespasser and a claim under ground 6 or ground 8? It seems clear that ground 8 would still be subject to Part 2 – so there is some protection there. But what about ground 6? Agreed 1.1 and 1.2 are rather contradictory, but 3.1 supports the 1.1 reading, that any claim where a possession order would be mandatory (Schedule 2 or s.21, or introductory or demoted) would fall under Part 3. But then 3.1 also gives as examples “non-secure tenancies, unlawful occupiers, succession claims, and severing of joint tenancies (by which I take it they mean joint tenancy ended by one tenant’s NTQ and possession against the occupier)”. But all of these are NTQ cases, with no security of tenure. 1.1 says “The protocol does not apply to claims in respect of long leases or to claims for possession where there is no security of tenure”. This is a muddle. Not good at all. I was thinking of Akerman-Livingston while I was writing my comment – which is why I mentioned summary judgment for public law defences; contrasted with the less certain teasing out of disability discrimination cases. Isn’t it right to say you can still have summary judgment if that judgment is that there is no seriously arguable case? Going back to 1.1. It begs the question, what does “no security of tenure” mean? I would argue that any case where the landlord needs to give NTQ has some security of tenure – just not very much. It seems to me that not having protection under the Protection from Eviction Act 1977 is not the same as not having any security of tenure. I understand security of tenure to be a way of describing how difficult it is to lose your home. I wonder if 1.1 is meant to exclude squatters from the PAP. Obviously they can be arrested and moved out that way at the moment, but perhaps the PAP is looking forward to a brighter, fairer future where good old-fashioned squatting is taken back off the criminal law books? Perhaps now is the time to launch a campaign to protect the rights of traditional hardworking squatter families. For the avoidance of doubt, that was meant to be satirical. I did put clever little fake html tags around it to show it was satire but the system has cleverly hidden my tags. No, the Equality Act test is precisely not the ‘seriously arguable’ test, that was the problem in Akerman. Just is the case ‘genuinely disputed on grounds that appear to be substantial’. I don’t think mere PEA protection equates to security of tenure. Otherwise mere licencees etc. could be said to have ‘security of tenure’ (so long as not excluded). And if 1.1 addresses squatters, why include ‘unlawful occupiers’ in 3.1? The thing is a mess. Whoops. Yes, not “seriously arguable”. What I meant (and completely failed) to say was that the PAP should encourage people to raise the issue of disability discrimination at an earlier point. This should help landlords to make better decisions about whether to proceed to court. And it should increase the possibility of summary judgment for defences with no merit: if the landlord can show that the tenant isn’t disabled, or the eviction is not linked to the disability, or that eviction was a proportionate means to achieve a legitimate aim. Back to 3.1: I suppose “unlawful occupiers” would include all trespassers – such as a tenant who has given NTQ and then changed his mind?